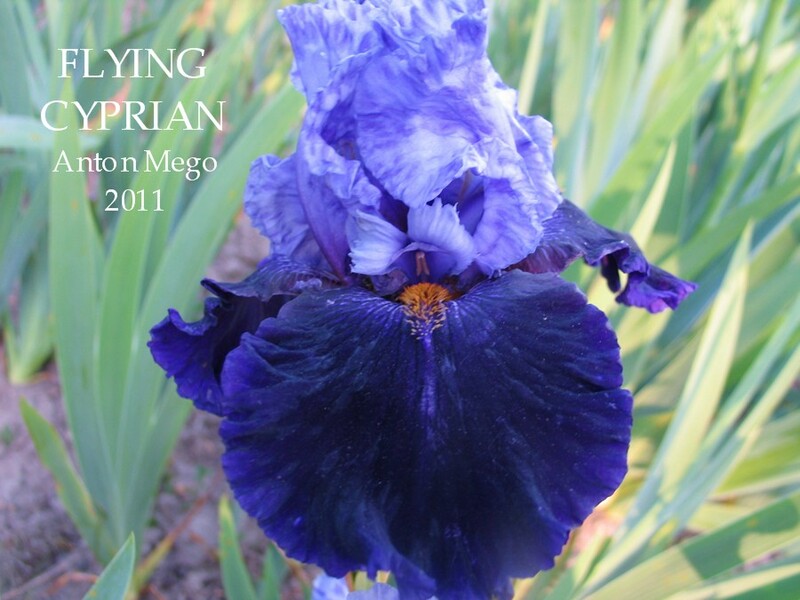 Anton Mego writes," 'FLYING CYPRIAN' attracts with non typical colouring. Standards are light blue coloured with non regular dark blue tint. From their parents falls inherit velvet plum dark purple colour with lighter margin. Falls surface is leathery like, not very typical. Cinnamon like orange beards supply the blossoms with unique patina. Nicely branched stalks have minimal 8 buds". FLYING CYPRIAN (Anton Mego, R. 2011). Sdlg. AM-04/1510-1. TB, 34.5" (88 cm), EM. S. light blue washed darker blue; style arms light blue; F. velvety plum-purple blue with lighter edge; beards cinnamon orange; slight sweet fragrance. AM-00/0493-1: (AM-96/0119-1: (Wild Jasmine x Hello Darkness)) x AM-93/0038-1: (Edith Wolford x Queen In Calico) X AM-96/0162-1: (Fancy Woman x Hello Darkness). Heritage Irises like to spoil our online visitors with the very new as well as all our Iris Heritage and it is indeed an honour to display all five Introductions by Anton Mego for the year 2012. Anton has also advised that only he will be selling these Irises commercially this season. As always, clicking the image will take you to the larger, higher resolution version. 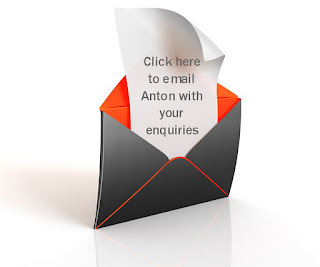 Major Hat tip and sincere thanks to Anton Mego. 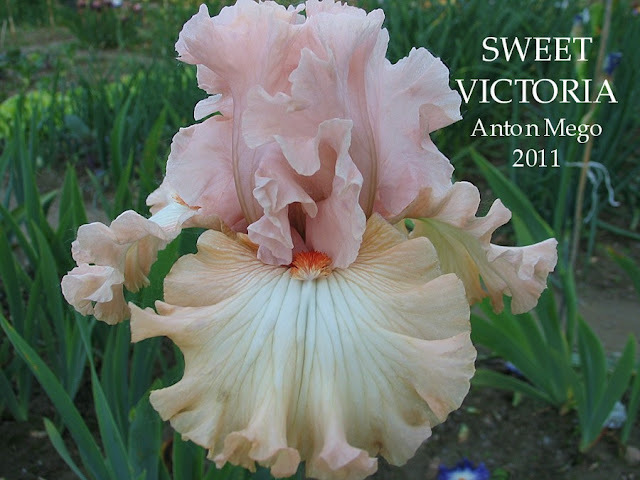 Anton Mego writes," 'SWEET VICTORIA' is a child of beautiful parents. Pink and creamy blossoms have a perfect form. Really stiff, waxy and wavy blossoms. On the stiff straight stalks are usually 6-8 buds. Striking dark orange brushes raise a very attractive impression". SWEET VICTORIA (Anton Mego, R. 2011). Sdlg. AM-04/1734-3. TB, 36" (92 cm), M. S. and style arms pink rose; F. light pink rose with cream centers; beards based white tipped dark orange; slight sweet fragrance; wavy. Kitty Kay X Paris Fashion. Anton Mego writes," 'ROYAL SUNSET', Extraordinary parents supplied Royal Sunset with the best genetic material. Standards are nicely formed lavender white colour. Margins are creamy brown, around the beards running inside the standards. Falls are velvet black purple colour. Around dark orange beards is a small light stain. Nicely wavy formed blossoms. healthy growing, predisposed to reproduce with at least 8 buds". 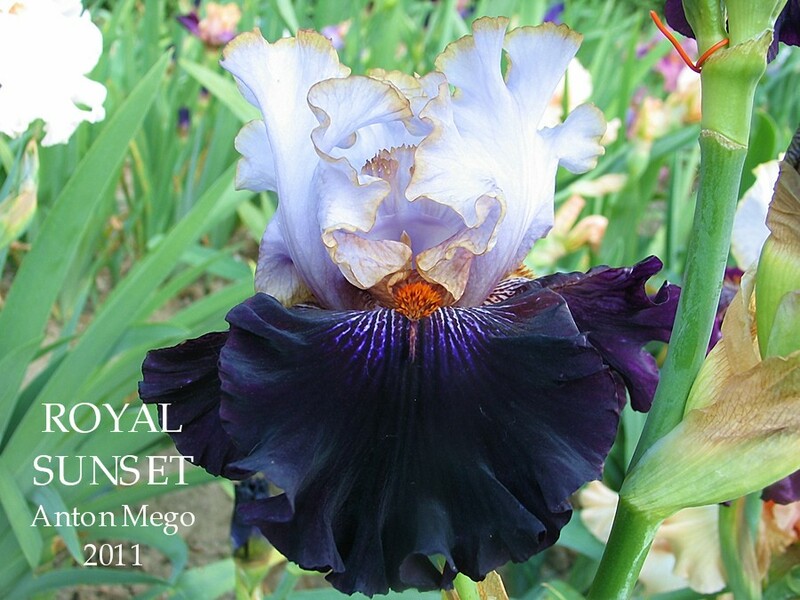 ROYAL SUNSET (Anton Mego, R. 2011). Sdlg. AM-05/1860-2. TB, 39" (86 cm), M. S. whitish lavender, creamy brown rim fading to whitish lavender; style arms creamy brown; F. velvety black purple, brighter close to beards; beards dark orange; slight sweet fragrance; wavy. AM-00/0559-9 X Starring. Photo credit and copyright Anton Mego. 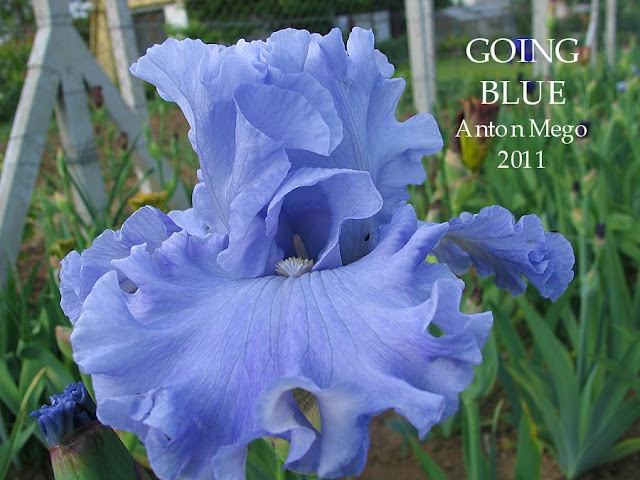 Anton Mego writes," 'GOING BLUE' is sky blue with perfect, wavy beautiful shaped blossoms. After its extraordinary parents Going blue inherits only good characteristics. Stiff stalks produce 8 buds giving rise 3 blossoms simultaneously. Healthy plant, no special care needed". (AM-00/0539 ((Conjuration x Twilight Blaze) x Honky Tonk Blues) x AM-99/0398: ((Honky Tonk Blues x (Altruist x Sea Of Joy)) x Abiding Joy)) X Sea Power. Anton Mego writes, "GARDEN PLEASURE is a garden lighthouse. Beautiful contrast between the standards and falls. Standards are creamy yellow with darker veins. Falls are wine-magenta, center of petals are lavender blue. Falls margins are thin creamy brown lined. Nice form and wavy blossoms make Garden Pleasure really charming. State of health and also the growth is very good. Stalks branch out really nice with at least 8 buds. Good parent". 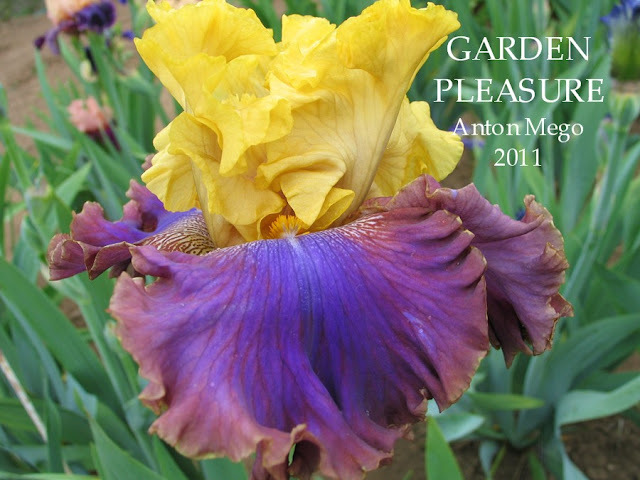 GARDEN PLEASURE (Anton Mego, R. 2011). Sdlg. AM-05/1896-2. TB, 35.5" (90 cm), M. S. cream yellow with darker veins; style arms cream yellow; F. wine-magenta, center of petals are lavender blue, edges cream brown; beards yellow with orange tipped hairs; slight sweet fragrance; wavy. AM-95/0085-2: (Honky Tonk Blues x Rustler) X AM-00/0559-9: (AM-98/0312: (Twilight Blaze x Night Attack) x Slovak Prince). 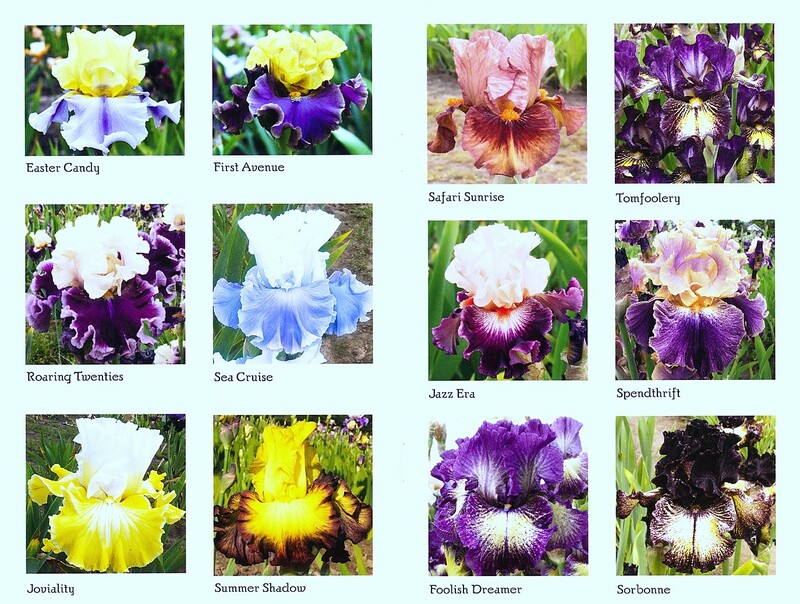 I have very limited information regarding the 1970-80 period of median irises,( As you can see below more information has come to hand since the original post date.) and I can find nothing about the Intermediate Iris 'Shampoo,' there is no mention of it in the AIS bulletins (I own a limited collection so lacks depth for this and other periods). I also just purchased 35 American Iris Catalogues from the sixties and seventies and eighties and surprisingly there is no listings of it in them. 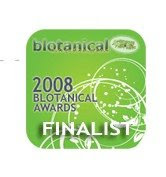 Now I find this unusual as the Iris received an Honorable Mention 1978, Award of Merit 1980, and the Hans and Jacob Sass Medal 1984, someone must of given it a great review somewhere. It is a vigorous Iris which handles neglect and I know this is true as it was originally growing in a 'heel in' bed over by the Woolshed and that I had thought I had lifted everything and transferred to some other gardens closer to the house. I went back the the temporary 'heel in' bed during the bloom season and there she was, pushing up through the weeds, (over at the Woolshed weeds are referred to as pasture) flowering its socks off, almost like a desperate plea, 'WHAT DO I HAVE TO DO TO GET YOUR ATTENTION??? THIS IS MY BEST SHOT!!!' So its a keeper no doubt about that, and yes its another of those 'Historic Iris' with ruffling. Cottage Gardens, Hayward, California, 1977 Catalog. Eden Road Iris Garden,Wenatchee, Washington, 1979 Catalog. 4~ Square Iris Gardens, Eau Claire,Wisconsin, Cold Climate Iris, 1983. The reason I have included this short and to the point listing is that the catalogue states 'plants are grown in a very harsh climate. Temperatures from -40°F in winter and up to 100°F in the summer. 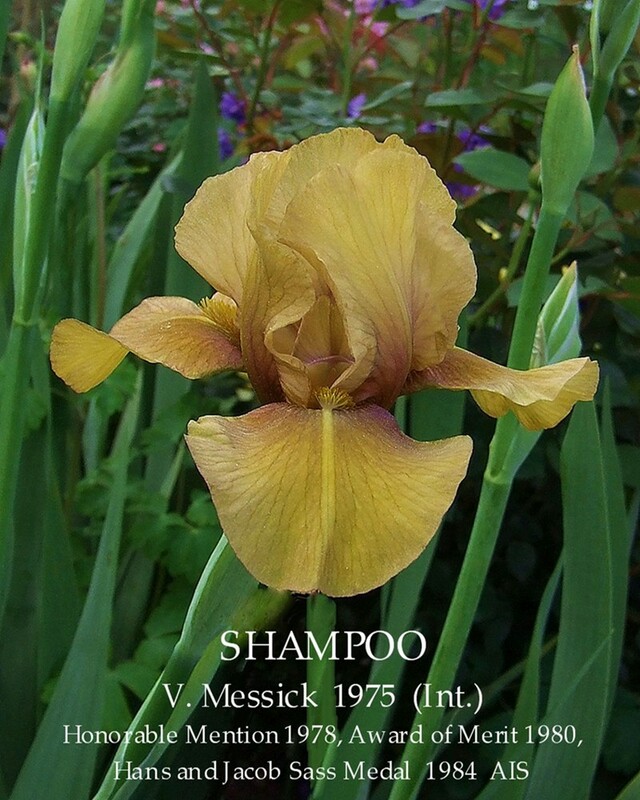 Coupled with the harsh climate is a short growing season' this would most likely indicate 'Shampoo' is a hardy iris. 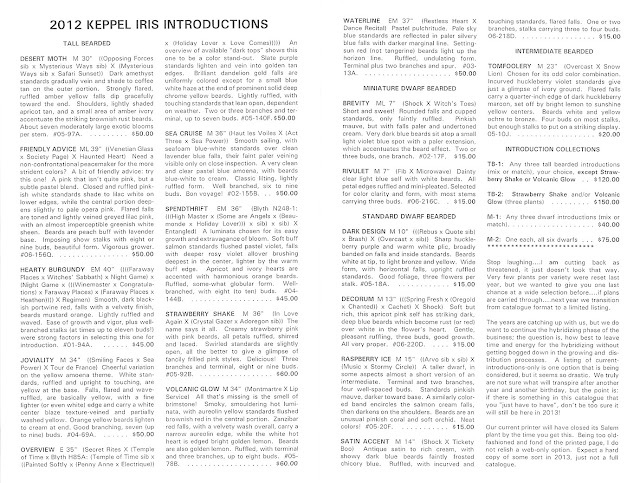 The Iris Yearbook (BIS), 1990, “Shorter Bearded Irises in 1990”, page 61, C.E.C. Bartlett. Another older variety which is always good is 'Shampoo' (Messick '77). It's strange greenish khaki colour is not to everyone's taste but bud placement and flower form are impeccable. In the right place in the garden where its colour can be complementary to soft yellows, limes and greens it is superb. Needless to say its immaculate form and placement make it perfect for Shows and floral art. 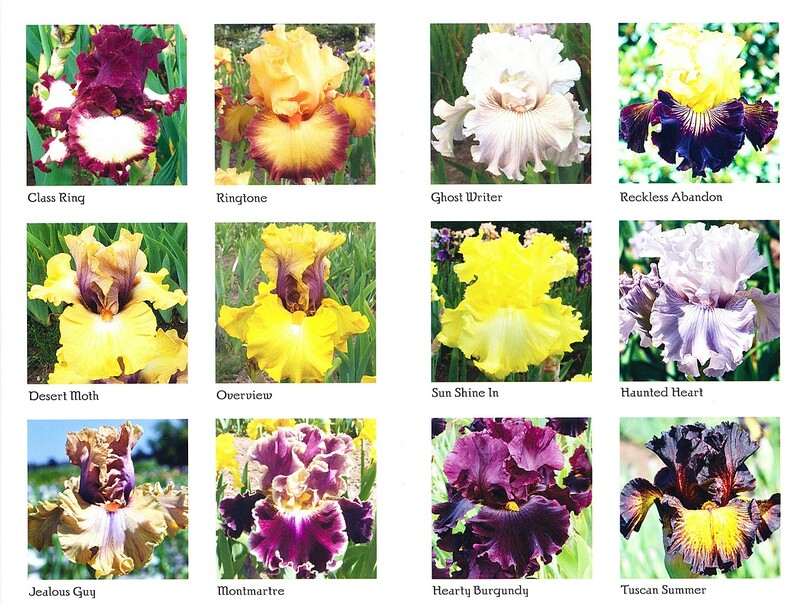 IRISES, A Gardener's Encyclopedia, Claire Austin. The flowers are a colour that is difficult to describe, a rather strange greenish brown, or yellow-bronze overlaid with smears of green and grey. The petals are crystalline, and a purple-maroon flush surrounds the hafts. The flower is Scented. Height 40cm (18½ in.) Blooms early season. SHAMPOO Virginia Messick, Reg 1975, Sdlg. 68-70. IB, 18" (46 cm), E. Ruffled bronze-gold self. Cambodia X Gingerbread Man. Cottage Gardens 1977. HM 1978, AM 1980, Sass Medal 1984. A big Hat Tip to Keith Keppel for his candid observations and the above catalogue listings. New Zealand Tall Bearded Iris "IRWELL SURPRISE"
Truly wonderful new entries into the New Zealand iris world are few and far between but every now and again even my iris world gets a surprise. Its a sensational Iris that caught me completely unaware arriving in the form of a photo sent by Carol Rogerson the owner of South Pacific Epiphyllums who grows this iris. I had never seen this iris before even though it was registered in 2006. It could of been called 'Caught me by Surprise' but then again when thinking of the varieties Ron has introduced to date he could of also have called it 'No Surprise Really' and I would have had to agreed.Now I know that the irises of Ron Busch have not had a smooth ride to success but you can't keep a good thing down forever. Nothing like a visionary emissary to remind us of the wondrous Irwell Iris we all have to look forward to in the coming years. I have had the privilege of reading Ron's very complicated Breeding notes and whilst the original registration states the parentage as 'Involved Irwell seedling lines', I have taken the liberty to fill in the missing parents. It does seem that broken color is most often linked with plicata, one way or another, and you will note the inclusion of various plicatas on both sides of the parentage. 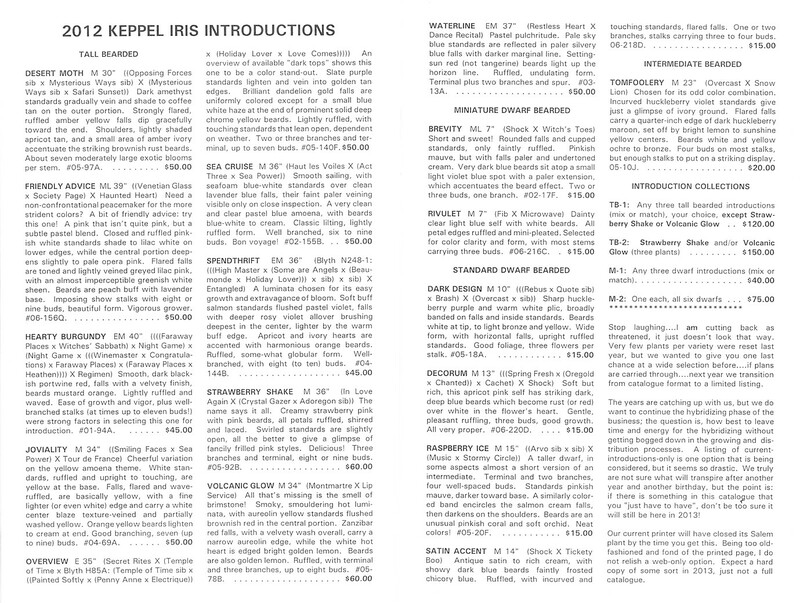 Yesterday the future arrived, doesn't happen often but that's the outcome when Keith Keppel's Iris Catalogue arrives in the post. Each catalogue received becomes part of the truly amazing continuum from one of the hybridising Giant's of the Iris world. It's just to bad Importing Irises to New Zealand is a wee bit tough at the present time!! 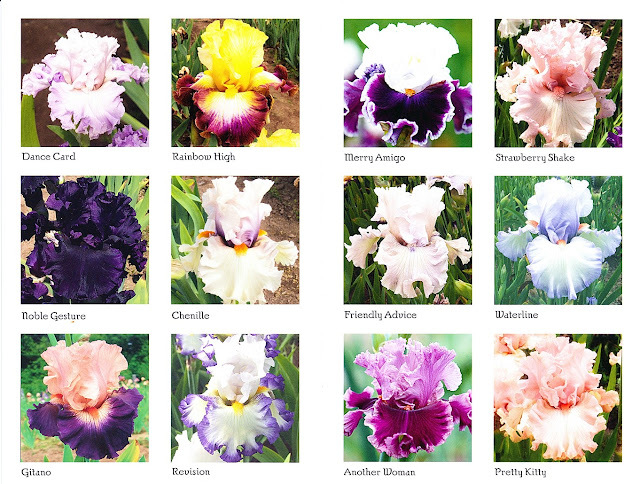 Anyway for those visitors to the blog lucky enough to live in the USA go and buy yourselves some classy Irises. Catalogue also contains a very large listing of Barry Blyth's Irises. 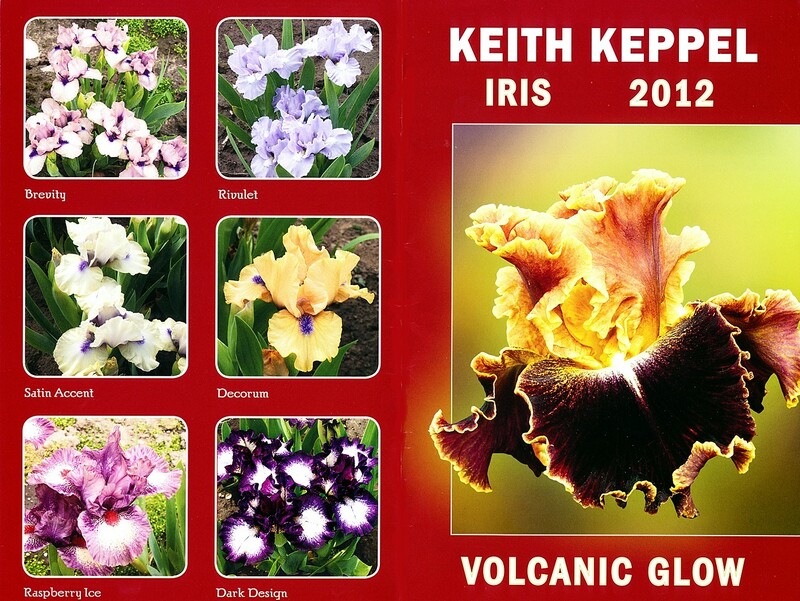 Keith does write however, that this is the last year to purchase a wide selection of irises before....if plans are carried through...next year they will transition from a catalogue format to a limited listing. This has become an annual event for Heritage Irises and I only received an email from Keith 2 days ago telling me among other things that the Catalogue was on its way so no complaints with the postal service this time. As always clicking on the above image will take you to the larger, higher resolution version which no doubt you can save and print. Tall Bearded Iris "PRINCE INDIGO"
An absolutely must have for a sixties historic iris collection is the sensational 'Prince Indigo' It creates a staggering picture in the garden and one of its most important qualities, in my opinion is its extremely vigorous growth that produces top quality stalks that can carry up to nine buds each of a truly distinctive lustrous purple colour with good form that will not be mistaken for any other Iris. PRINCE INDIGO (Schreiner 1964) L 38"
PRINCE INDIGO- L 38". The rich violet hue, the even colouring, the luxurious pile, the generous size, and the superb branching stamps this as an Iris classic. 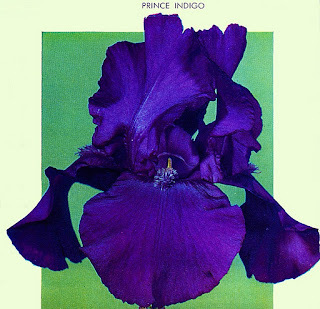 PRINCE INDIGO (Schreiners, R. 1964). Sdlg. R-631-l. TB 38" L. V1D. Pansy-violet self, violet cast beard. First Violet X King's Choice., Schreiners 1964. HC 1963, HM 1965, JC 1965, 1966, AM 1967. Tall Bearded Heirloom Iris "NEW DAWN"
I thought this an appropriately named heirloom iris to celebrate the New Year. NEW DAWN' is an Iris with star quality in both parentage and colouration. In 1928 Emily Jean Burgess (later Jean Stevens) somehow crossed the early flowering William Rickatson Dykes-bred, pearly white coloured 'Moonlight' with Sir Arthur Horts' late flowering purple bi-colour iris ‘Hermione’. The resultant seedling with no description of colour or form was only ever labelled 'E97' and in 1931 Jean crossed it with Arthur Bliss’s 'Mrs Valerie West' to produce the clean and finely textured primrose yellow cultivar. On its release in England, 'New Dawn' was often compared with 'Helios' which in the early 1930s, along with W .R. 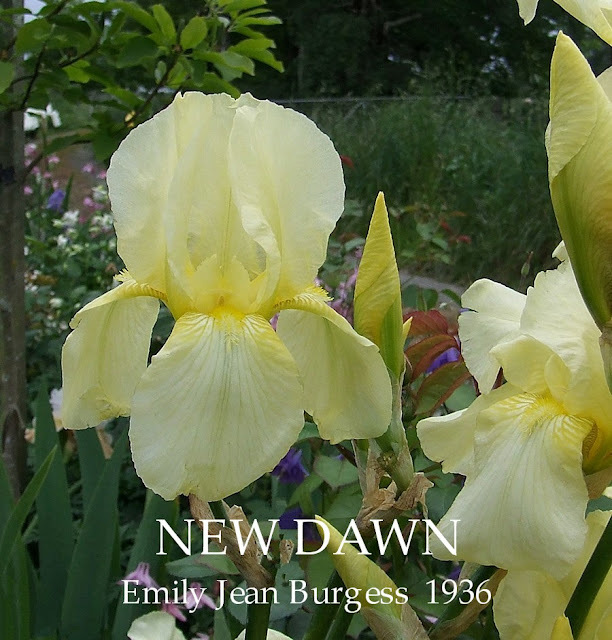 Dykes were the standard-bearers for yellow irises. These had clean yellow standards with yellow falls that were reticulated, generally in a tone of light purple brown. 'New Dawn' was a triumph in light yellow breeding because of its clean colouration on the standards and falls and was without doubt at least the equal to the introductions of the late 1930s in the same colour range, such as 'Happy Days', 'Golden Bear','Lady Paramount', and 'Primrose'. Jean had a firm opinion on striation or reticulation and often noted that it was a fault in Irises, as its presence almost invariably detracted from the purity of the colour tone. She also used the term 'rough' in reference to veining. 'New Dawn' is an Iris with vigour, large numbers of bloom and has excellent increase, outperforming most of the more modern Irises. The large buds of intense primrose are a feature in themselves. Found growing in a garden in Carterton, my plants were given to me by the garden owner who had surplus plants established over the fence, growing alongside the railway line. Vigour is as good as 'Magnolia". Its the pollen parent to the New Zealand heirloom white iris 'Wychnor' featured on the blog last November. New Dawn (Stevens)-- A seedling raised in New Zealand. It is a splendid grower, and is much improved Helios in colour,a pale lemon-yellow without streaks, and a fine shapely flower of real merit. It is I am told a Moonlight -Valerie West derivative. "The truth is Golden Hind (and its numerous descendants) has now given me all the yellows I could want or even find room for and I for one shall not attempt any further crosses with what is nevertheless the best parent for yellows I have yet come across, so just why it should be so, in view of its distinctly plebeian parentage, is one of those mysteries of hereditary which is impossible to fathom. About the same time that I started on these crosses I received the big yellowish-cream New Zealander, New Dawn from its raiser Mrs W. R. Stevens. New Dawn is (Moonlight x Hermione) X Mrs Valerie West, and is therefore, I should judge-assuming Moonlight to have had a good deal to do with the production of W.R. Dykes-not wholly unconnected with Golden Hind. No two yellows could be much more dissimilar, however, in build, and I should certainly not have used it except for lack of other material. It too proved an easy as well as valuable seed parent, though, unlike Golden Hind, it is not apt to produce the shapeliest of seedlings. But they have substance, they are always large and stout growers, and now and then one may get a perfect seedling from it. Crossed with Purple Dusk, it produced a really superb white, spangled with a gold dust, which is different from any other I know. I should think it may prove one of the best seed-parents now available although a good many of the seedlings from it may be inferior in form. But Mr Long, who has used Valerie West far more than I have may very likely have a good reason to challenge that." Another outstanding seedling of our own raising which already has been highly commented upon in England. Of particularly heavy substance and finest texture, this Iris will stand up to a adverse weather conditions better than any variety we know. It has a vigorous constitution and a long flowering period. The large well formed flowers are a clear lemon entirely unveined. One leading English Iris critic has described New Dawn as "Superb in every respect" 3ft. NEW DAWN Miss E.J. Burgess, Reg., 1936. Sdlg.1/H2 TB, 38″, EML, Y4L. Standards and Falls clearest creamy yellow. S.2¾″ X 2½" . F. 2⅝" X 2½" Beard sulphur yellow. Very good substance and shape. Lightly veined olive green at haft of the fall. Well branched, and stands up well to the weather. 38″ Description E.J.Burgess Studbook notes,‘1935 flowering’; (Moonlight x Hermione) X Mrs Valerie West. 'Introduced' Stevens Bros Catalogue 1937-38.